Here are some facts about Carlisle Castle. Carlisle Castle is located in the city of the same name, in Cumbria. The castle is close to the border between England and Scotland, and the remains of the Roman Hadrian’s Wall. The castle is the largest and best preserved of Cumbria’s several castles. It was built on the site of a Roman fort which was home to Roman soldiers between the 1st and 4th centuries. It was built during the 11th century under the command of King William II. His plan was to defend the northern part of England against attacks from Scotland. 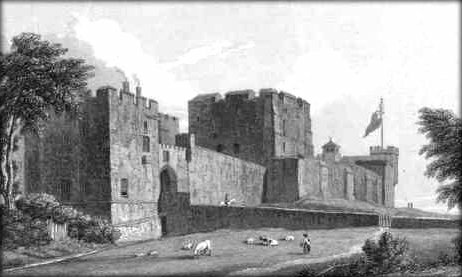 Because of its important location near the border between England and Scotland, Carlisle Castle changed hands many times during its first few hundred years. During the mid-16th century, King Henry VIII used the castle to store artillery and weapons. Mary, Queen of Scots, was kept prisoner there for several months in 1567. During the second Jacobite rising in 1745, Carlisle Castle was part of some important battles. But once the Jacobites were defeated, the castle was no longer needed to defend the border. In the mid-18th century, the castle was abandoned and parts of it were demolished to use for building materials. The army then took over the castle, and the Territorial Army still uses it today. Within the castle is the Cumbria Museum of Military Life. The museum has displays of uniforms, weapons, medals and other items from several of the area’s historic regiments. The second floor of the main tower has mysterious wall carvings, dating from about 1480. They show people, faces, animals and abstract shapes and patterns. Carlisle Castle is said to be haunted by several ghosts. They include a dead sentry, an old caretaker, two medieval soldiers, and King Stephen whose ghost appears next to a model of the city in a display case. What next? Discover some more facts about castles by visiting our castles resources page.